Yet another blog chronicling the mid life crisis of some bloke. Only it is for a good cause and you might even learn something from my obsessive travails... Even if it is just what NOT to do. I'm the first to admit that it is a very silly goal to try to beat 3 hours in the Marathon. Why? Firstly, because every Marathon is different be it due to weather conditions or hills and, secondly, because being able to say that you ran a Marathon in "2 hours something" shouldn't really apply to being just one second faster than someone who took 3 hours to complete it. But, as I have said many times before on this blog, running a Marathon or an Ironman is hardly what would be classified as "sensible behaviour" in the first place, so who is to criticize the setting of a somewhat arbitrary goal. 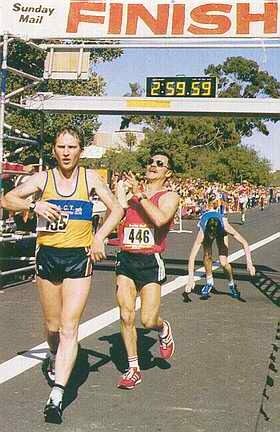 The three hour mark in the Marathon happens to be a bit of a Holy Grail for many amateur runners. It's quite fast but by no means elite level. I have one friend who has been oh-so-close to breaking it - for example, in Seville he stopped to argue with a police car that crossed in front of him (later the policeman paid him a visit at his house after looking up his race number!) and ended up finishing in 3:00:12. Yesterday I read an interesting article in Lava magazine, which was based on interviews with the male and female Ironman World record holders (although, if you include Challenge Roth, this record was beaten a week later): Marino Vanhoenacker and Chrissie Wellington. In it, they both say that "age groupers" (the commonly accepted euphemism for non-professional triathlete) shouldn't obsess with results and should remember to enjoy it. Chrissie put it like this: "I see people cross the finish line and the first thing they do is look down at their watch. Stop it! Get an awesome finish line photo and bank that memory. The timing chip can sort the rest out later.” On the one hand it's tempting to say, "It's alright for you to say that - you are the fastest in the World, ever!" but it's also true that she has a good point. I've said before that one of the things I like about the Ironman distance is that you really can't compare one race to another, not even from one year to another over the same course. I think that there is something to be said for trying to get a personal best time. In Spanish there is a word which is hard to translate into English - "superación" - it means the act of trying to better oneself. That I think is a very laudable goal - the mistake is to convert it into numbers. Just to know that you have done your best and that you have experienced or learned something new is "superación" enough. Just over 3 years ago, I decided that enough was enough and I made a radical change in my life. I gave up smoking, drinking (well, for a while anyway...) even biting my nails and decided to GET FIT again. Unfortunately I don't seem to be able to do anything in moderation and throwing myself into running and cycling after 15 years of sofa-lounging came with more than its fair share of injuries: torn meniscus, torn Achilles, torn hamstring, shoulder luxation, stress fracture in metatarsal bone, fractured elbow. I'm hoping (TOUCH WOOD) that that is all behind me now. My Altum Barefoot Dress Shoes have arrived!! !